Growing plants from seed can be great fun, but if you’ve never done it before it’s hard to know where to start. How do you know which seeds to plant when, and how to plant them? And what do all those strange terms on the back of seed packets mean? Here’s a quick guide to the language of seed growing, plus a few suggestions for seeds that you can plant now. Here are some of the terms you’ll come across on seed packets. Seed leaves – the first pair of leaves to appear. They contain stored food to help the seedling to grow, and often look different from the plant’s mature leaves. True leaves – Usually the second pair of leaves to appear, and the first ones to resemble the plant’s mature leaves. Direct sowing – sowing seeds directly into the ground outdoors, instead of in seed trays or pots indoors. 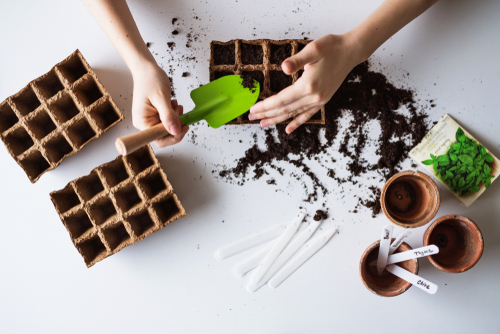 Pricking out – removing young seedlings from a seed tray using a small stick (ice lolly sticks are ideal) and transplanting them into individual pots to grow on. Hardening off – acclimatising indoor-grown plants to outdoor conditions by placing them outside during the day and bringing them in at night for a period of 7-10 days before planting out. Hardy annuals (plants that live for just one year) are great for beginners, as they’re easy to sow and look gorgeous in flower. Cornflowers (Centaurea cyanus), field poppies (Papaver rhoeas) and love-in-the-mist (Nigella damascena) are three of the most popular. Choose a sunny site and dig the soil over, removing any weeds and stones, then tread it down lightly to get rid of air pockets and rake it over to produce a level surface with a light, crumbly texture. Scatter the seeds over the area, then rake lightly to cover them. Water regularly. When the seedlings come up, thin out any overcrowded patches. You can direct sow French beans outdoors in late May or June, but to get a head start, sow them indoors in April. Fill small pots or modules with seed compost, then, poke a hole in the compost in each pot about 5cm (2in) deep and drop in a bean seed. Cover over and press down lightly to firm the compost. Water the pots, then place them inside a clear plastic bag and put them on a sunny windowsill. Once leaves appear, remove the plastic bag and let the seedlings grow until the weather is warm enough to plant them outside. Harden the seedlings off before planting. Once you’ve started growing your own plants from seed, the sky’s the limit! There’s a huge range of all types of seed available at our garden centre, plus pots, compost and everything else you need to get you going.